Heavyweight 180 gram red vinyl. After their initial eight-minute sonic rollercoaster ILL on Dan Carey’s Speedy Wunderground imprint and their subsequent debut album Means, Fews return with a brand new ten-track studio album, Into Red. Following extensive touring throughout 2016-17, including two tour runs as special guests of Pixies, the Anglo-American-Swedish quartet retired to Malmö with the Swedish city’s underbelly providing the perfect environment for unfettered artistic endeavours and the subsequent album recording. 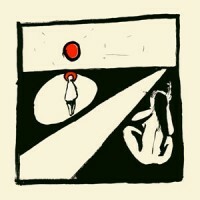 Co-produced by Joakim Lindberg (Hater) and mixed by James Dring ‘Into Red’ sees Fews extricating their influences to reveal a band assuredly moving on from the template of their debut album Means with a confident post-punk swagger and no little addition of muscular heft on the song-writing front. Barry says: Throbbing distorted basses and screeching, echoing reverbs work their way below the vocals, at times delivered monotonally a-la post-punk gloom, and in other moments with the acrobatic intensity shadowed by the beautiful soaring instrumentals and richly constructed backline. It's safe to say, Fews are here to stay.